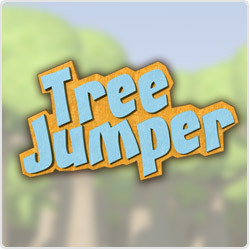 Click a logo below to view Tree Jumper in Apple's App Store or the Android Market. "a lot of fun, and challenging"
Jump as high as you can in this insanely addictive game! You control a rare blue squirrel as he jumps from branch to branch up the tree. Reach new heights to unlock power-ups and items to help along the way! But watch out for traps and other animals in the tree! Innovative platform design---rotate around the tree as you jump from branch to branch! Unlock fireballs, lightning and other power-ups by reaching new heights! Unlock items to help you jump higher, like trampolines and springs! Avoid enemy animals like birds and nests of bees! Available now for Android and iOS (iPhone, iPad, and iPod Touch)!